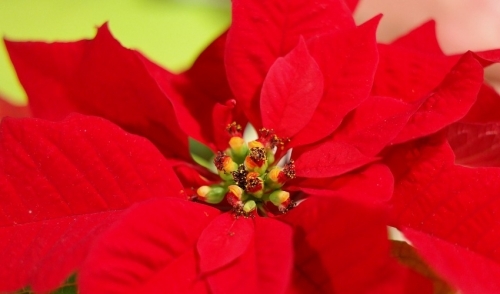 For most Americans poinsettias are like Christmas trees: You buy them for Christmas, and throw them out along with all that shredded wrapping paper. But if you just can't bear to toss out your poinsettia, there's no reason why you can't keep it around till next Christmas. However, the plant does take some careful handling: It needs a very sunny spot where temperatures range between 65 F at night and 80 F during the day. And to bring out the full color next season, starting around Labor Day you'll have to cut the plant off from all light between evenings and mornings for up to 8 weeks--even incidental glare from outside streetlights, for example, is out of the question. A simple trick is to use an empty box covered in black plastic as a cover. Once color returns the plant, bring it back to its usual full-time spot. And always water the soil when it feels dry and feed with a good fertilizer. If you want to start new poinsettias, make cuttings in May or June.